Gluten sensitivity is a genetic autoimmune disorder where the ingestion of gluten leads to damage in the small intestine. It is estimated to affect 1 in 100 people worldwide. Two and one-half million Americans are undiagnosed and are at risk for long-term health complications. 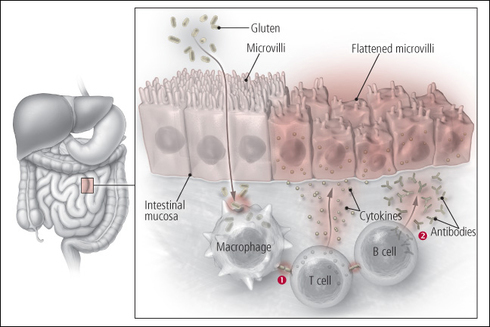 When people with gluten sensitivity eat gluten (a protein found in wheat, rye and barley), their body mounts an immune response that attacks the small intestine. 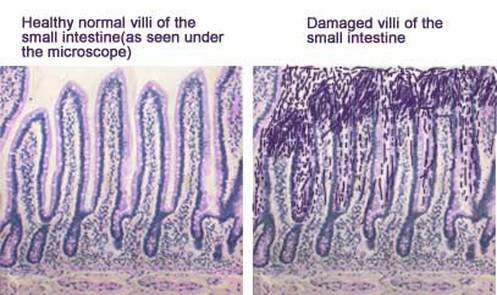 These attacks lead to damage on the villi, small fingerlike projections that line the small intestine, that promote nutrient absorption. 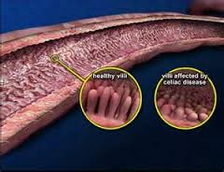 When the villi get damaged, nutrients cannot be absorbed properly into the body. Gluten sensitivity is hereditary, meaning that it runs in families. People with a first-degree relative with gluten sensitivity (parent, child, sibling) have a 1 in 10 risk of developing gluten sensitivity. Gluten sensitivity is also known as celiac disease, celiac sprue, non-tropical sprue, and gluten sensitive enteropathy. There are over 200 medical conditions that gluten can either cause, contribute to, or make worse. Villous atrophy can also be caused by corn, soy, dairy, and parasite infections. Vitamin C can help heal inflammatory damage caused by gluten. Gluten can contribute to testosterone problems in men. 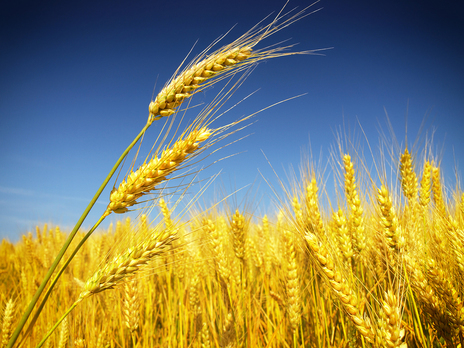 Sometimes gluten gets blamed for health problems caused by other proteins found in grain. Processed food can be cross contaminated with gluten up to 41% of the time. As many as 92% of the people following a gluten free diet continue to have health problems because of cross contamination, processed food, and consumption of corn, rice, sorghum and other grains. It can take 3 years to fully recover from gluten induced disease. Gluten free on the label doesn’t make the food healthy. You can take a quick and easy quiz to help you determine whether going gluten free is a good idea for you. Now this list could keep going on and on, but I stop at 44 because it is my 44th birthday! The links in this post are extremely valuable and may help someone you Love. Please don’t be stingy and share the knowledge by passing this post along. Gluten sensitivity can develop at any age after people start eating foods or medicines that contain gluten. Left untreated, celiac disease can lead to additional serious health problems. Gluten sensitivity is associated with a number of autoimmune disorders, with the most common being thyroid disease and Type 1 Diabetes. There are more than 200 symptoms associated with celiac disease, which makes diagnosis difficult. A significant percentage of people with celiac disease, both adults and children, have no or minimal symptoms. CDF offers a Symptoms Checklist to help you and your physician determine if you should be tested for celiac disease. A simple blood test is available to screen for celiac disease. People with celiac disease who eat gluten have higher than normal levels of certain antibodies in their blood. These antibodies are produced by the immune system because it views gluten (the proteins found in wheat, rye and barley) as a threat. You must be on a gluten-containing diet for antibody (blood) testing to be accurate. The only way to confirm a celiac disease diagnosis is by undergoing an endoscopic biopsy of the small intestine. Some people experience symptoms found in celiac disease, such as “foggy mind”, depression, ADHD-like behavior, abdominal pain, bloating, diarrhea, constipation, headaches, bone or joint pain, and chronic fatigue when they have gluten in their diet, yet do not test positive for celiac disease. 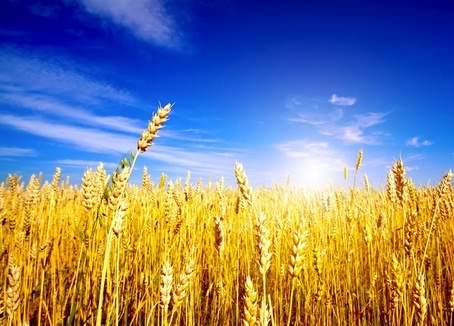 The terms non-celiac gluten sensitivity (NCGS) and non-celiac wheat sensitivity (NCWS) are generally used to refer to this condition, when removing gluten from the diet resolves symptoms. 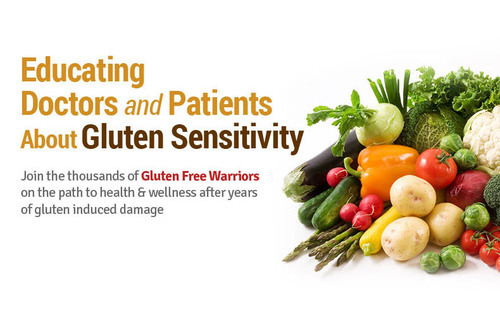 Currently, the only treatment for celiac disease and non-celiac wheat sensitivity is lifelong adherence to a strict gluten-free diet. 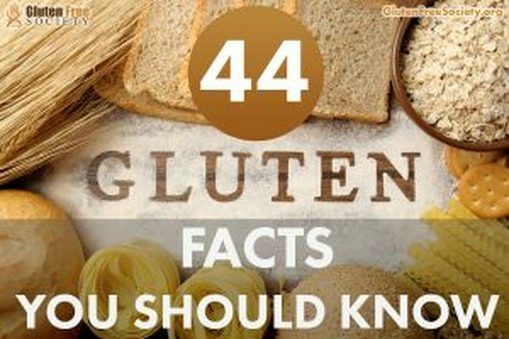 People living gluten-free must avoid foods with wheat, rye and barley, such as bread and beer. Ingesting small amounts of gluten, like crumbs from a cutting board or toaster, can trigger intestinal damage. Once diagnosed, annual follow-up with your physician is necessary to monitor nutritional deficiencies and your compliance with a gluten-free diet, as well as assess for associated conditions. Celiac Disease Foundation can help you find the right doctor to discuss symptoms, diagnose, and treat celiac disease. Our nationwide Healthcare Practitioner Directory lists primary care physicians and specialists,and dietitians and mental health professionals, experienced in celiac disease and non-celiac wheat sensitivity.